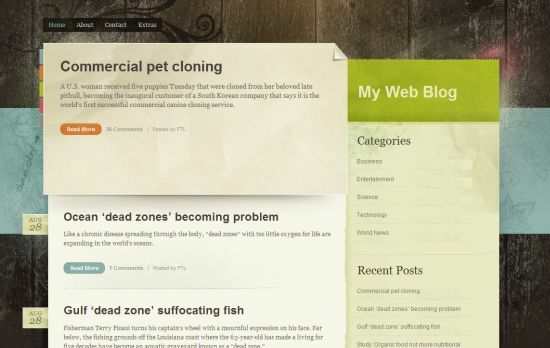 Recently I’ve listed Simple WordPress Themes and Ugly WordPress Themes. 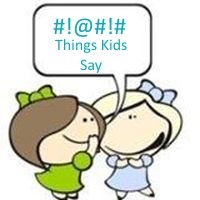 Today I thought I would list those that have something different about them – some sort of unique feature. I hope you enjoy them. Let me know if you like any of them. Or let me know if you hate them all. 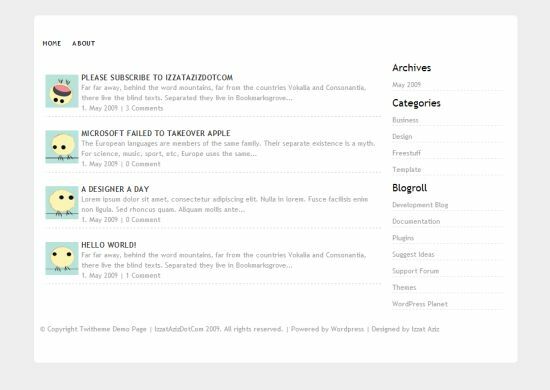 Simple Paper – This theme has a simple and clean look – it could easily be listed on the Simple Themes lists. What is unique about this theme is the navigation on the top left rather than at the top of the page. The striped background is also different and has a masculine look to it. Infinity – This theme contains a variety of very different elements that pull together and somehow work. The header remind me of a jungle or nature or even the Monkey Island game series. The main content area is a dark magazine style theme, there are photos in the footer and then the very bottom section looks like an office or desk. It would seem like the different areas would clash but the theme seems to work. I don’t think I would use – I can’t actually think of a use for it but I still like the look of this unique theme. Agregado – The unique feature of Agregado is the built in lifestreaming feature and contact form. The small menu in the top right that contains the search and RSS feed is different too. I’m not fond of the darkness of this theme but I do like the features contained within it. Color Paper – The torn paper look with the wooden style background is different. On the left of the featured content area are little color blocks. If you click on them it changes the color of the links and the Read More buttons. 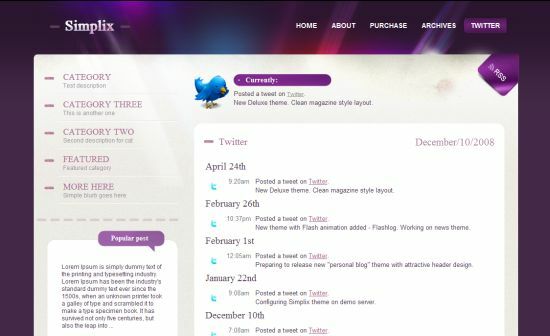 Simplix – Simplix features twitter integration, four styles to choose from and custom widgets for banner ads. There is page based navigation at the top and category navigation on the top left. The last twitter tweet is shown at the top of the page and an entire page is dedicated to a twitter stream. This theme, however, is not free. 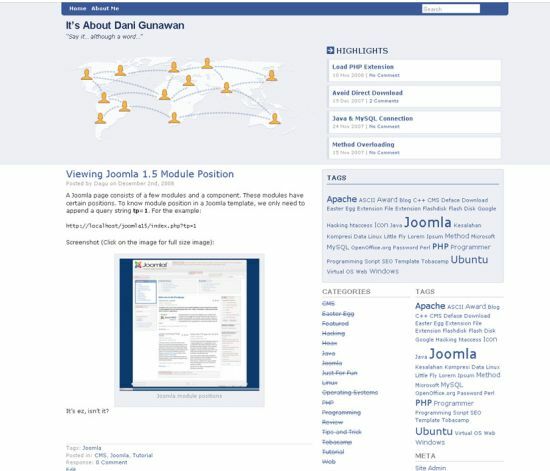 Facebook Lover – This theme looks just like Facebook. I don’t love Facebook enough to have my site look like it but I suppose it could be useful for a blog about Facebook. Twitheme – A simple theme inspired by Twitter. I just love wordpress themes, specially which makes me feel the power of Web 2.0. Hi – Thanks for visiting. I’m glad you like the list of themes. I actually really like Infinity. Well, that screenshot of it anyway. I’m not sure how I would feel actually using it but it looks pretty cool. Hi Denver – Thank you for visiting and commenting. WOW, Agregado is uber pretty. Me likey. Kinda makes me forget about the dog. except it’s kind of dark. The infinity and the Color paper themes really catch my attention. Hi Madhur – I like Infinity but I’m not sure why. I don’t know what kind of site I would use it one either. Nice selection of themes, as always. I am in search of something for a theme to use for a WordPress as CMS site, so any new theme suggestions are a plus! I like the “Color Paper” , my favorite colors, adding little more images it can be very stylish I think. Hi – I like the colors on that one too. i like the color paper theme. that’s nice..the colors seem so natural looking. i’ll see about downloading that one and using it in the future. 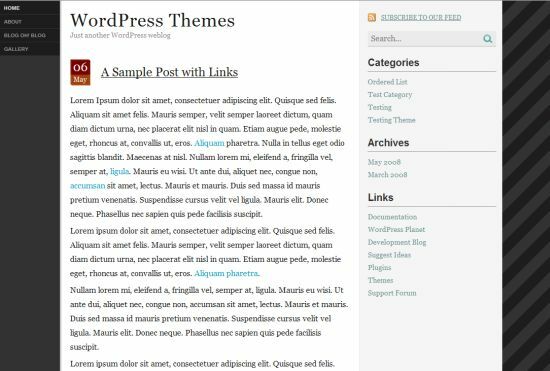 Another great WordPress Theme series! I am sure you will be able to dig out more and more unique themes. I love Simplix amongst all here! Hi Raju – Thanks! I think Simplix is really pretty. 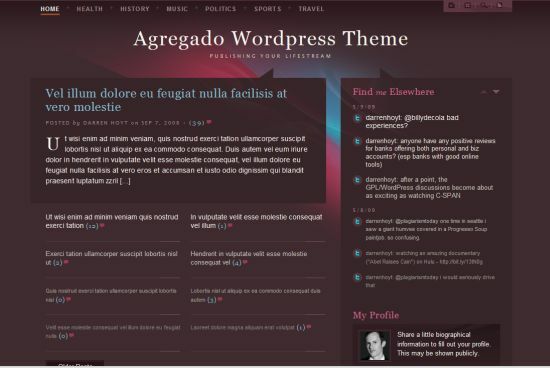 I like Agregado theme even though it is dark. I usually dislike it when the background is black. 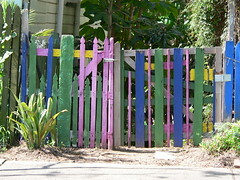 Hi Carla – Me too – I would like to see that one with a different color scheme. Hi Dot – Thanks! Someone else reported the same problem but so far I can’t duplicate it. I’m hoping it was a temporary glitch – I’m also going to look at the database later and make sure everything is a-okay. among all the theme I like the infinity theme the most ..
Hi – That one seems to be popular. The twit theme is too simple and Infinity is too cluttered. If I had to pick from that bunch I would go for Agregado, even though the colors are not to my liking. Hi Sire – I like the layout of Agregado too but I agree that it is too dark. BTW, i have changed my theme. Do check and give your suggestions and feedback. Hi Nihar – Thanks! I’ll head over and take a look. The Simplix theme is really looking good. The infinity one is pretty cool, but maybe not very practical. The facebook theme is a cool idea too. I’m sure I’ll start seeing that on some blogs soon. it would only makes sense for a blog about facebook. Very impressive list! My personal favorite is the “Facebook Lover” theme. Very never seen one like that before. .-= jay @ work at home´s last blog ..Need Help With Google Adsense? Ask Lisa! =-. Hi Jay – That theme would be useful for a blog about facebook I suppose.